USDINR has again slid below 68.75 marks with intraday bias remains bearish for the moment. We prefer to take a short position on both technical and fundamental grounds. 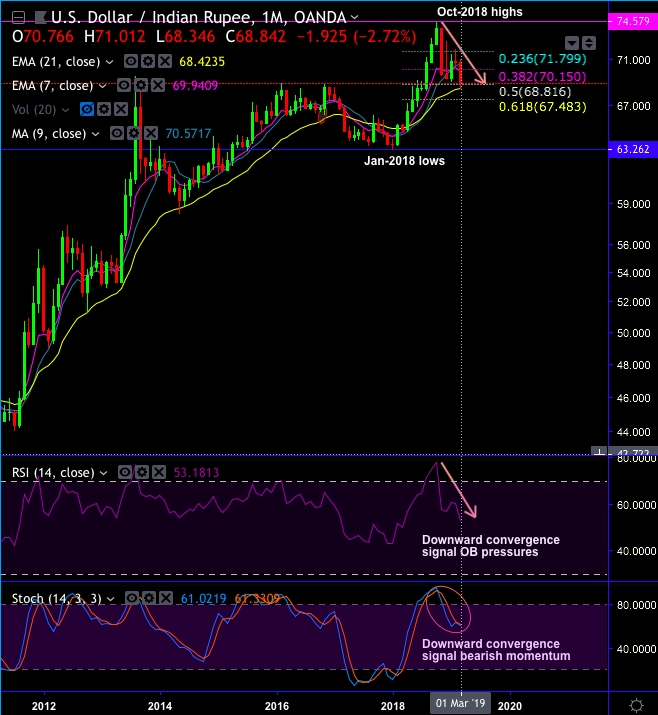 Technically, the pair has formed the bearish engulfing pattern that plummets prices below 7-EMAs as momentum oscillators signal intensified bearish momentum (refer above chart). The Reserve Bank of India’s upcoming USD5bn swap deal which is scheduled on March 26thneeds to be observed in a context that the deal should be perceived as a new instrument to infuse liquidity and not as a tool to influence the exchange rate. Theoretically, the RBI’s purchases of US dollars from banks in exchange for rupees should work against further appreciation via the fall in the implied yield for the longer-dated USDINR forwards. It is reckoned that, in the short-term, the Indian rupee has become a barometer of the Indian union elections to be scheduled between April 11thand May 19th. This was best reflected by the surge in net foreign equity investment in February-March. The Sensex has rallied 8.5% since February 19 on polls that no longer point to a hung parliament but a victory for Prime Minister Modi and his coalition. The rupee has also been helped by a favorable external environment. The Fed’s pause in hiking rates has renewed interest in carry trades in the South and Southeast Asian currencies. Global equity markets have recovered on US and China working towards a trade deal and the UK looking to avert a disorderly Brexit. Unfortunately, none of these factors are firm. We are still looking for two Fed hikes in the second half of this year. As for the negotiations, there are no guarantees that intentions would lead to a US-China trade deal in 2Q’19 or that the UK avoids exiting the EU without a deal on March 29. Neither will there be a repeat of the landslide victory for Prime Minister Modi and the enthusiasm for reforms witnessed at the 2014 elections. We remain mindful that Modi’s first term resulted in record lows for the rupee on twin fiscal and current account deficit and rising external debt. Our target remains for USDINR to end the year above 70. In short-term, profit-taking has started to set in after USDINR hit 68.9, the 50% retracement level of its 2018 rise (refer above chart). Currency Strength Index: FxWirePro's hourly USD spot index is inching towards -26 levels (which is mildly bearish), while articulating (at 13:02 GMT).